Blog - We know a thing or two about stylish and well-crafted soft-sided luggages! We know a thing or two about stylish and well-crafted soft-sided luggages! If you have ever needed to purchase a soft-sided luggage bag for one of your trips around the world (don’t lie... we’re sure you embark on many of them), a lot of different options may have sprung to your mind. However, we’re sure there are no soft-sided luggages that you would want to be bringing with you on your next international trek more than one of our very own carpet bags here at Carpet Bags! Why should you buy a carpet bag for your next holiday or trip? Well, why shouldn’t you? 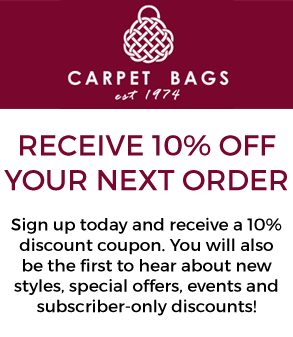 Carpet bags are associated with the finest in international elegance, having come to prominence in the United States and Europe in the 19th century, when many people were only just acquainting themselves with the pleasures of travelling around the world for the first time. The carpet bag was invented in the first place as a more convenient alternative to wooden or metal trunks, which required the use of porters. By contrast, a carpet bag was light enough for the owner to carry themselves, and soon captured the imagination as a symbol of self-sufficiency. In the 1873 Jules Verne novel Around the World in Eighty Days, for example, the carpet bag was the sole luggage choice of Phileas Fogg and Passepartout, and was sufficient for a few items of clothing and a lot of cash. Then, there is – of course – the incomparable Mary Poppins with her magical carpet bag that she always arrived clutching. With our commitment to the very best in good old British craftsmanship and gorgeous fabrics too, you can be sure of finding quite the eye-catching travel-ready carpet bag among our generous selection of soft-sided luggages. For those whistle-stop weekend breaks, perhaps it’s our Beta bag that you will fall in love with, thanks to its combination of carpet and leather shoulder straps and external front pockets? Or maybe you might be more drawn to the Henry, which folds away perfectly for storage, or even our simply incredible Global Gladstone bag, which is a modern design nonetheless reminiscent of a bygone age? This latter generously-featured carpet bag incorporates a strong steel frame covered with carpet, and each one is truly unique, being hand cut and sporting a carpet pattern placement that differs from that of any other bag we make. We’re pretty proud of our soft-sided luggages – so why not take similar pride in making one of them your own?